Catheter-based treatments have revolutionized the management of occlusive renovascular disease. However, because many patients may have stenosis without clinical effect, treatment should be limited to hemodynamically significant stenoses in patients in the clinical scenarios mentioned earlier. Patients with significant truncal stenosis or FMD should be treated with angioplasty. Primary stenting is needed for ostial lesions because the elastic recoil of aortic plaques makes them resistant to angioplasty (Fig. 17). 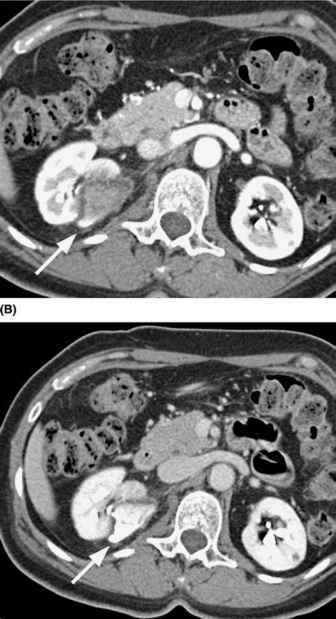 Factors suggestive of successful revascularization include: bilateral disease, preservation of renal mass, preserved function on nuclear scintigra-phy, and minimal arteriolar sclerosis on biopsy (119). A meta-analysis by Rees (120) reported a 99% primary patency rate for stents in 1128 arteries (cf. 55% and 70% for percutaneous transluminal angioplasty of ostial and nonostial stenoses, respectively) and a secondary patency of 77% at a mean of 7.9 months. Figure 17 The same patient shown in Figure 1. 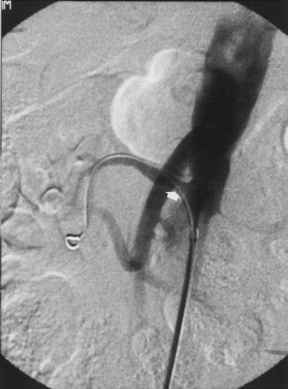 Post-stent angiogram showing normal lumen dimensions following deployment of a 6 mm balloon expandable stent (arrow). The guidewire is still within the artery.